Trollius sp. / Ranunculus sp. ? 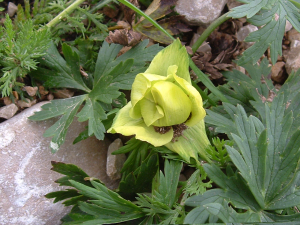 Observation - Trollius sp. / Ranunculus sp. ? - Global. Description: Low plant approx. 5cm high, flower approx. 4cm across. Leaves polygonal in outline, deeply lobed. Flower acid green, open globe shape. Growing at 1800m on Monte Baldo. Low plant approx. 5cm high, flower approx. 4cm across. Leaves polygonal in outline, deeply lobed. Flower acid green, open globe shape. Growing at 1800m on Monte Baldo.